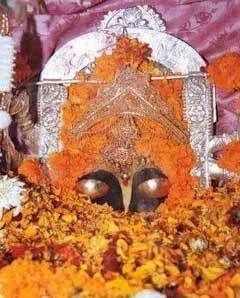 The Temple of Shri Naina Devi ji is situated in Bilaspur District of Himachal Pradesh. The temple is situated on a beautiful hillock. This place is about 60 km from Bilaspur and about 20 km from Anandpur Sahib (Punjab). It is one of the 51 Shaktipeeths. According to a belief, Sati(godess) died to avenge the insult by her father of her love for Shiva. The dist-ranged Shiva picked up her corpse and gyrated in his horrific dance of destruction. Lord Vishnu, the preserver, in order to save the earth from Shiva’s wrath unleashed his Chakra and cut the body into 51 pieces. All the fifty one places where parts of Sati’s body fell became known as Shakti Peeths. Naina Devi, is where Sati’s eyes are believed to have fallen. In Hindi language “Naina” means Eyes. 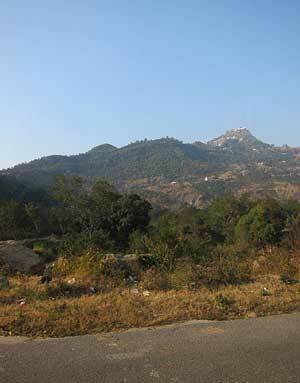 Nearby Shri Naina Devi temple is the holy cave in the name of goddess. A big fair during Shravan Ashtami and in the Navratras of Chaitra & Ashwin, fairs commemorating the goddess are held here. The initial temple was said to be built by a Gujjar shepherd. The hills of Naina Devi Temple overlook the Gobind Sagar lake. The lake was created by the Bhakra-Nangal Dam. Shri Naina Devi Temple is connected with National Highway No. 21. Temple is about 60 km from Bilaspur town and about 20 KM from Anandpur Sahib (in Punjab). The temple can be reached via road that curves round the hill up to a certain point. Then walked on foot on concrete steps that finally reach the top. 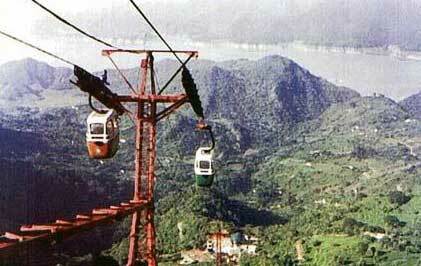 There is also a cable car facility that moves pilgrims from the base of the hill all the way to the top.